The Glamour Jewelry Box is a new jewelry subscription box that promises to send you three boutique jewelry pieces a month that have been curated by fashion experts! COUPON: Use code CJ10 to save 10% off your first box! Good to Know: They have a 30-day hassle-free return policy! All of the jewelry came packed in this velvet bag. And my necklace was wrapped further for more protection. This didn’t come with a traditional info sheet listing the names and values of the prices, and that really hinders my ability to know what to call these pieces. This necklace features collar-like hammered gold bars that dangle from the 16-inch chain, and I love it! The hammered finish adds texture to make this more interesting, and I like that the bars vary in length. This gold bar stud earrings are simple, classic, and lovely! They match the necklace but can also be worn on their own, and I found them comfortable to wear all day (with no discoloration to my earlobes). This is another beautiful piece that matches the necklace but can also be worn on its own. It is adjustable but not flimsy, and it is comfortable to wear without being bulky. Here I am wearing the earrings and necklace. The Verdict: As a whole, I absolutely LOVE the jewelry sent to me this month. I am looking to up my accessories game, and these pieces are chic and stylish without being too trendy (as in, they won’t go out of style anytime soon). I do have a few complaints- I wish I knew the material used to make these pieces, and I also wish the info sheet gave more details (such as a name for the piece). Glamour Jewelry Box says that each box contains a value of at least $75, and without more information, I cannot accurately say if that promise has been met. What I can say is that these pieces feel like they are better quality than jewelry I would get from a place like Forever 21, and I am happy with the cost per piece of the box. Can you get this box if you sign up today? I am not sure. 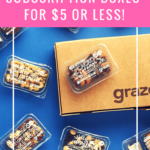 You will get your first box when you first sign up, and after that boxes ship on the 5th of each month. 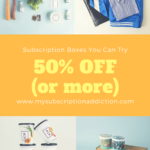 Coupon – Use code CJ10 to save 10% off your first box! Value Breakdown: This box cost $32.95 ($29.95 + $3 shipping), which breaks down to $10.98 per piece. What do you think of my Glamour Jewelry Box? Can you select your preferred metal color?? Can you select your preferred jewelry metal color? ?